Back at Rainham RSPB on Saturday 29 November 2014 birding on the way via the Stone Barges, which held 70 Black-tailed Godwits on the shore alongside Redshank and a flighty group of 15 Dunlin. 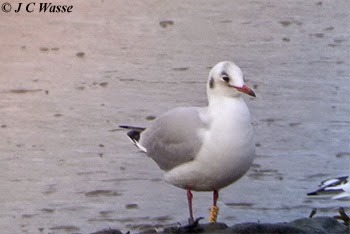 Lots of colour-ringed Gulls here and at nearby Coldharbour Point - 4 Black-headed Gulls, 3 LBB Gulls and 2 Herring Gulls. 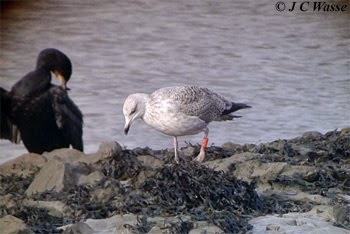 All were wearing either orange or yellow rings and from previous experience this suggests birds ringed locally. A couple of examples shown here - imm. 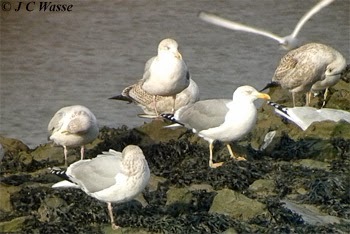 Herring Gull (U1GT) and adult Black-headed Gull (2CPK) plus an unringed adult Yellow-legged Gull amongst the roosting commoner gulls. A walk around the reserve produced sightings of Marsh Harrier, Buzzard and the pair of Peregrines. A Brent Goose was dwarfed in flight by its Greylag friends over Wennington Marsh and a couple of Raven sightings both on the reserve and over the tip on the way back added to the mix. Stonechats and loud Cetti's Warblers were a good supporting cast. Again, no sign of SE Owls over/around the Silts at sunset, but 5 RN Parakeets flew east to roost.